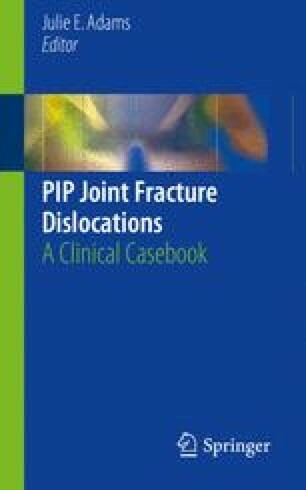 Dorsal PIP joint fracture-dislocations are challenging injuries. Dynamic external fixation devices are ideal to restore congruency and stability and to allow for early controlled motion, particularly in the settings of dorsal fracture-dislocations, pilon fractures, and selected complex middle phalanx fractures. This technique may be used as an adjunctive treatment to open or percutaneous fixation. Contraindications include chronic injury, certain fractures involving P1 or P2 head/neck, poor skin coverage, and significant preexisting arthritis. Dynamic wire-form traction with rubber band technique (Suzuki) and without rubber band technique (push traction) are both illustrated. Reverse push traction is also demonstrated. The authors demonstrate the tips and techniques and pearls of application of traction/external fixation.